Enable the Trace Port Interface as described in the STM32F3xx Reference Manual, chapters Pinout and Debug Port Pins and TRACE Pin Assignment. Configure µVision to capture trace data. 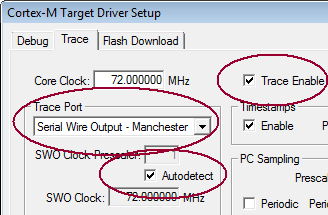 Set Trace Port to Serial Wire Output - Manchester and enable Autodetect. Always synchronize the settings in the *.ini file with the settings in the Target Driver Setup—Trace Port dialog. Use the examples delivered with the Keil board MCBSTM32F300 as a reference.